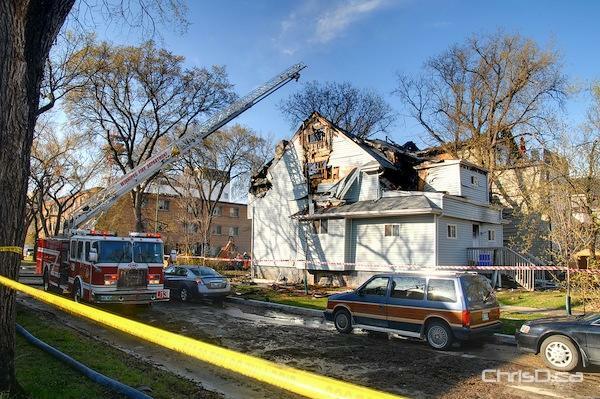 Two homes in Winnipeg’s Corydon Avenue area are completely destroyed after an early morning fire Tuesday. Crews responded to a home at the corner of McMillan Avenue and Daly Street at about 2:30 a.m. to find the structure completely engulfed. Flames later spread to a neighbouring home. One person was transported in stable condition to hospital. Meanwhile, Manitoba Hydro crews worked to contain gas leaks at both residences. A backhoe was called in to begin digging in the front yard of one of the homes. Damage to the two homes is estimated at $600,000 and $400,000. The arson unit is currently investigating.